The organ (Zeffirini /Badia Florence) is 16th century and in 2012 was "returned to a temperament (tuning system) closer to that in which it was first built". I bet the Italian style harpsichord, a modern copy of an anonymous instrument, is tuned likewise. Daniele Boccaccio prides himself on the way his preparation has been informed by historical considerations. His style is very deeply felt, which is much appreciated in the contrapuntal music. Without wishing to lapse into racial stereotypes, he makes the music sing. One idea you sometimes hear about Froberger's music is that it falls into two types: contrapuntal and expressive. This is something I've seen suggested by Davitt Moroney for example. In a good performance like Boccaccio's you hear that this idea is really misleading, and that the Fantasias and Canzoni and Toccatas, properly played, are, as much as the death music, infused with a dark brooding sadness. Listening to this interpretation of suites by Colin Tilney, two thought crossed my mind. One is a comment by Kenneth Gilbert about Rameau, where he says that inégalité isn't a decoration added to the music, it is rather organic to the basic pulse. That is why basic pulse is so important, what you lose if you play every movement like an unmeasured prelude (Cates? Cera? Rübsam? )! And the other is how Tilney's touch makes each note in a phrase meaningful, presumably because there's a bit of air between each note. It is tempting to say that Tilney's style is emotionally restrained. But it is not true, any more than it is with Leonhardt's Froberger. It's just that the naturalness and eloquence of what he does makes the interpretation seem to vanish, he's like the stage conjuror who makes the lady in the box disappear! Continuing to reflect on this alleged coolth of his contrapuntal music, as opposed to the late suites, and my dubiousness thereof, I listened to a few recordings of the D minor ricercar today, which Leonhardt recorded, as did Tilney. Well I stumbled across an old BNL CD from someone called Anne Robert. And you know, this lady has a talent for finding the affect in Toccatas, ricercari, cappricci, fantasias etc. A bit in the Verlet vain, but different, if you know what I mean. Less random rubato, less over-interpreted. The harpsichord sounds like a Hemsch: a powerful and rich bass, well balanced. I note that I can find no mention of a Hemsch harpsichord at Chateau De La Fontasse. So go figure. Sound Engineering is OK, a bit too close for me, but I don't want to cavil. The cover says vol 1 - but so far it's the only Froberger from her that I've found, nothing further is listed in the Bibliothèque Nationale de France. Thanks for the recommendations. I do not think I have anything of this composer. I am really enjoying exploring music (especially for organ) by some of the lesser known names in late Renaissance-early Baroque music: Siefert, Volckmar, Mohnheim, Gronau, et al. Frescobaldi is the next one on my list to explore. The concept behind this CD from Bob van Asperen is to alternate the sunny canzoni with the darker toccatas and Fantasias. The organ in San Martini, Bologna is, according to Aeolus's website, tuned meantone, but is it really tuned 1/4 comma? I don't have the confidence to say, but it feels wrong. In Asperen's hands it sounds as rich as a piece of Yorkshire Parkin. That's a lot of ginger cake. I'm afraid to say I don't think that he's a good enough organist to pull it off. It lacks . . . life. Dry parkin. 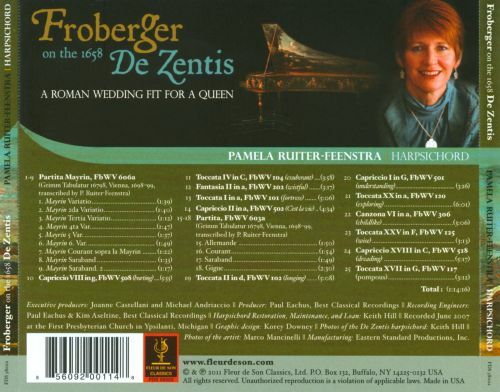 One of the performances on this CD by Pamela Ruiter Feenstra, is, IMO, a "great" bit of Froberger playing. It is the D minor Toccata, FbWV 102. I say this because of two things: the intense feeling and the complex voicing. That's how I came to find the CD - while comparing versions of this Toccata. There are other interesting ones - Mortensen, Vartolo - but Ruiter Feenstra's made me see what I like about Froberger's Italianate music. Her grasp of the toccatas is, generally, a high point of her art in this CD. JJK's Toccatas and contrapuntal pieces are less dramatic and flamboyant than Frescobaldi's, and Pamela Ruiter Feenstra is completely in her element in the relatively reflective musical idiom. She tends to choose, correctly in my view, slowish tempos, which creates an air of introspection, and lets the listener appreciate the gestures in the music. She has an acute feeling for the dialogue of the counterpoint: voices are in complex dramatic relation with each other, a sort of conversation or dance of voices. It is nothing short of astonishing - only Asperen comes close to playing like this, but maybe not so much in Froberger, where he seems to have other preoccupations. This gives her style of playing a unique sort of élan. I do not think I have anything of this composer. The selection of music is wide - from Italianate contrapuntal music, levitation toccatas, French style suites. The instruments are perfect - organ by Christian Mueller in Amsterdam and an Italian style harpsichord by Martin Showroneck. The sound engineering is exceptional. The playing is abstract, you certainly don't feel as Leonhardt is expressing his own personal emotional world like you do with Verlet, but it is not at all cold or inhuman, on the contrary. It has this quality which I noticed in Tilney's recording of making each note sound meaningful by letting each note respire - I can't explain it better, you have to hear it. And in Froberger I think that's really important. 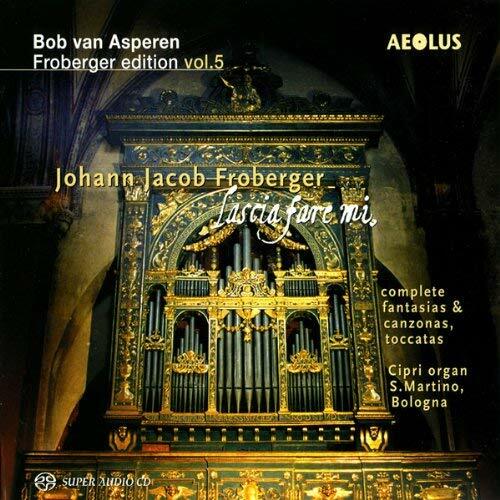 As for Froberger's keyboard works played on harpsichord, I am totally commited to Bob van Asperen's recordings on Æolus in his series of the complete keyboard works (just completed, overview HERE. 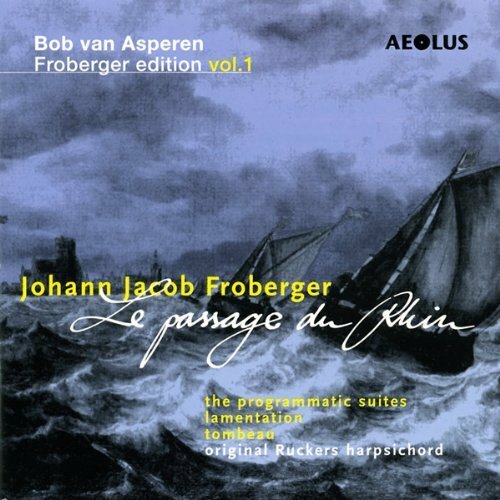 Another set with harpsichord music by Johann Jakob Froberger, whose first rate harpsichord music seems to be as enigmatic and elusive as F. Couperin's. 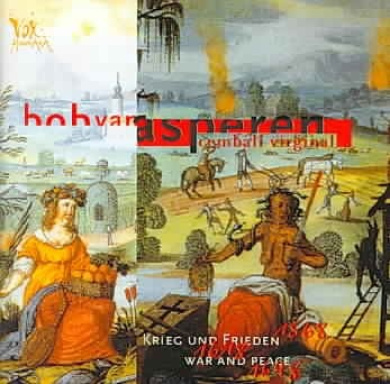 First volume (2 CD's) by Dutch harpsichordist Bob van Asperen in what will be a complete keyboard music series on the small German label Aeolus. The recording is absolutely wonderful (the founders of the label are sound engineers): my ideal harpsichord recording - not to bright and up-close, but not too "spacious" or reverberant either. Very natural and clear. Van Asperen plays a Ruckers harpsichord from 1640 with a firm and deep tone. As of the interpretation. I have still very little to go on as means of comparison, owning just the superb Baiano disc on Symphonia (see earlier post) to date. 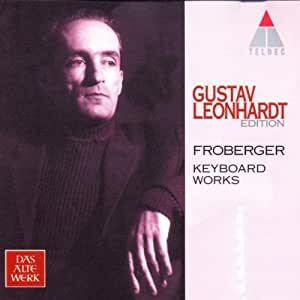 And as I said, Froberger's music is elusive and I haven't settled on a "ideal Froberger" in my mind, if ever. Though this recording is another step forward in that process. Van Asperen does not take the intellectually probing approach of Baiano, his style is ....more leisurely, genial, benign, playful at times. Van Asperen lets things unfold with emphasis on the careful development of phrases and the blending of the sound. And it is that transparant sound picture and the seemingly uncomplicated way the music develops, that are the key attractions of his playing. Very good indeed, though at some instances I wished for more "grip" and more extrovert "brilliance". I think I will continue this series and try some other interpretations at the same time. I'm very glad I went through with this and got the second volume, because reservations I had before - the occasional diminished "structural grip" and moments the music felt "static" without sufficient forward thrust, have entirely dissapated with this volume. And all the positives remain: Van Asperen is a master in letting the music enfold naturally, and in evoking a lush and exotic sound picture. Again brilliantly recorded, but this time another harpsichord is used: a Couchet-Blanchet-Taskin. A Flemish built/French adapted harpsichord, whith a sound that is slighly softer edged and less bright than the Ruckers in the first volume, but which sounds as rich. A short note on the music: the more I hear of it, the more I'm fascinated by Froberger's enigmatic and "fantastical" music. But an acquired taste, I'm sure. Reaffirming my recommendation for this Froberger series by Bob van Asperen after listening to the 3rd installment. Performances are beyond reproach IMO: clarity and equilibrity, combined with sufficient impetus and playfulness - wonderful! 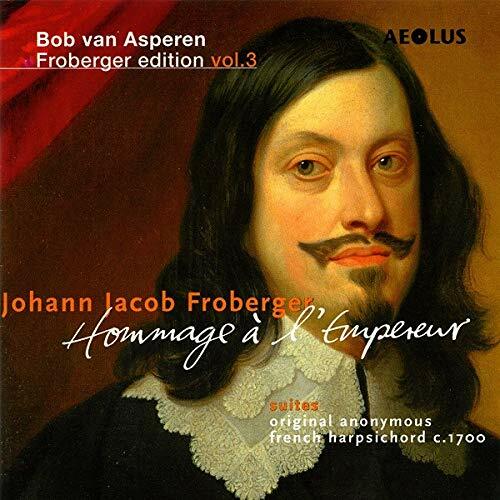 Van Asperen plays a lush and transparent sounding anonymous French harpsichord from c.1700. In the three volumes that I've acquired so far, this series goes from strength to strength - more information in the posts above. 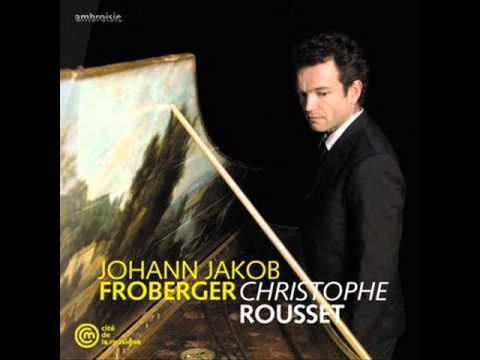 And my favourable impression of Froberger's music - continues to be strengthened as well. As Premont commented before, this is an excellent disc. 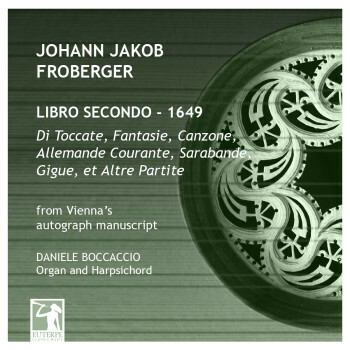 Coming from Froberger's works for harpsichord (see the German Baroque thread) that are very much oriented on the French tradition, this is somewhat of a surprise since this seems to me quite focused on Italian organ music by Frescobaldi et al. Pretty elusive and somewhat austere stuff too, basically a large collection of exercises in counterpoint. 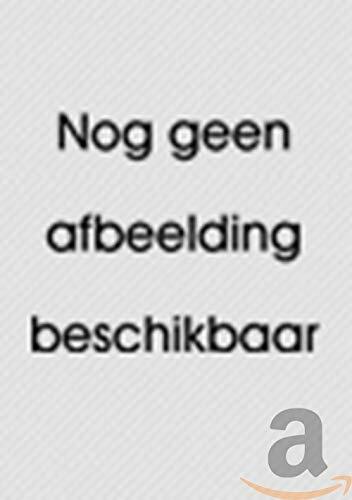 Playing by Van Asperen is pretty straight, unfussy. It is on the conservative side but not as much as his teacher Leonhardt. What makes it a success is the flexibility and subtle phrasing, bold at some times, almost transcendental at others. And the warm, intimate, characterful and transparent sound of the organ of the Basilica S.Martini in Bologna, built in 1556 by Giovanni Cipri. Recording by the German label Aeolus, that specialises in organ music, is exemplary. A rewarding disc for advanced organ listeners. Firstly you had some doubts on the tuning.... The booklet states mean-tone tuning at a' = 435 Hz. Although the notes provide ample background information on the organ, it does not offer an explanation why this particular organ was chosen. However, the strong influence of Froberger's teacher Girolamo Frescobaldi in these works is emphasised. Cheers q. I like Asperen when he's playing harpsichord, I hope I will get the hang of his organ style one day. Thanks for bringing this Baroquester to my attention. 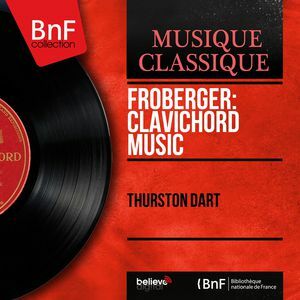 An analytic and phlegmatic and level headed approach to Froberger in this the second recording by Chrostophe Rousset. Anyone who enjoys the Teldec recording from Leonhardt will find some of the same approach here. Dedicated to suites, some of them not so often performers outside of complete sets. So basically I think this is really valuable recording, and it shows a rather surprising side of Rousset - not at all intuitive, savage, spontaneous or dramatic. But they are not "da bomb" as harpsichord are…. In a way they remind me of how Van Asperen used to sound on the harpsichord: studious, on the conservative side. I can imagine other players to infuse some more life into it. Andre Marcon comes to mind (he did a miscellaneous recital that includes some Froberger on DIVOX), also expert in the Southern Germanic organ School, Joseph Kelemen. To my surprise he did an entire Froberger disc on Arte Nova that I need to track down… Another candidate might be Stefano Molardi. One to take into account is Roland Götz, and Davitt Moroney. And Daniele Boccacio who I mentioned above. Both use outstanding organs. I'll try to make some comments about Kelemen's disc later, he uses an anachronistic organ. 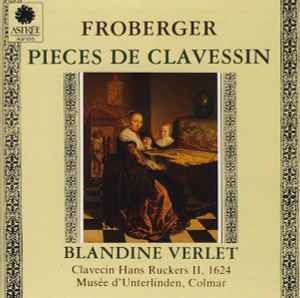 The above is Blandine Verlet's first Froberger CD (1989), played on the Ruckers Colmar, tuned meantone I believe, and not to be confused with her later recording (2000) which is now released with the moniker "L'Intranquilité"
There's a Toccata (XI) which is, I believe, a levitation Toccata - it is astonishing to hear this played on a harpsichord, especially this one with this tuning. The way Toccata II follows on from the Blancrocher Tombeau is a really imaginative bit of programming. The Gigues are particularly special I think, the rhythms! The style of play is an antinomy, like so much in music. On the one had muscular, bracing, lively, extrovert and strongly rhythmic. On the other hand it is full of fantasy. Very much worth hearing, even for those who found the second recording over-interpreted. 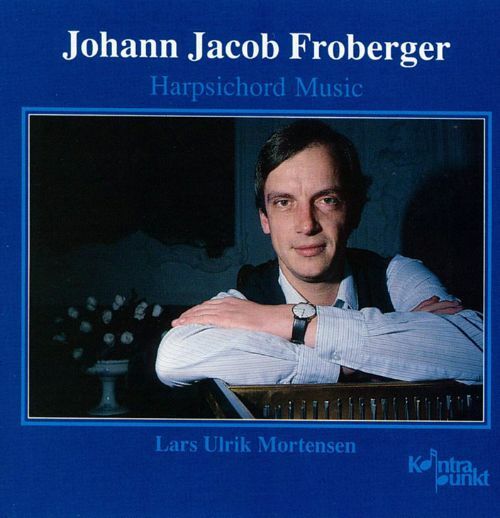 I'm recording the complete works for harpsichord and organ of Johann Jakob Froberger for the dutch label Brilliant Classics (production by OnClassical). For this project I have chosen to use two important italian historical organs, where I'm proud to be titular organist: the organ by Domenico Di Lorenzo da Lucca (1509-1521) in the church of Santissima Annunziata and the instrument by Onofrio Zeffirini da Cortona (1558) in the church of Badia Fiorentina, both in the historical centre of Florence (IT). As with many of Lars Ulrik Mortensen's recordings the instrument is quite resonant. He plays in a way which is texturally busy - not much space between notes because of the ornamentation, but the phrasing is clear and sharp - I can't really think of the word in English but in French you'd say the phrasing is tranchant - "decisive" is possibly the right word - so there's no problem with respiration. The recording is taken from an audience's perspective - it's good and natural, what you might hear if you were in a recital. But it's not what people expect from harpsichord recordings, which are often recorded as if the microphone is actually in the instrument. The performances are very distinctive because they are passionate - not miserable melancholy, but hot hot hot! Like he's boiling over with emotions, Latin emotions. Even in a sweet little thing like the partita on Die Mayerin he's intense, ardent. The combination of the unusual sound, the busy textures and the fervour have made this a really challenging recording for me to get into (I'm a Brit so my upper lip is stiff.) But now I've lightened up and I love it. Two little finds, both clavichord performances of the A minor Fantasia FbWV 202, both quite slowed down. Dart is deep and lyrical, Tüma exudes a simple and touching humanity. Both absolutely riveting.